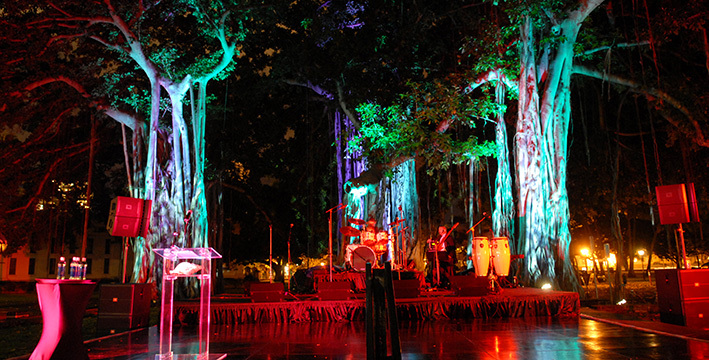 The Banyan Terrace features a slightly elevated terrace area amidst a large Indian banyan tree, which may have been planted by Queen Kapiolani. This location is best suited for small outdoor parties, intimate gatherings, award presentations, gala dinners or intimate concerts. For an additional $1,500 the first floor of Iolani Palace will be made available with docents to guide your guests through the building. 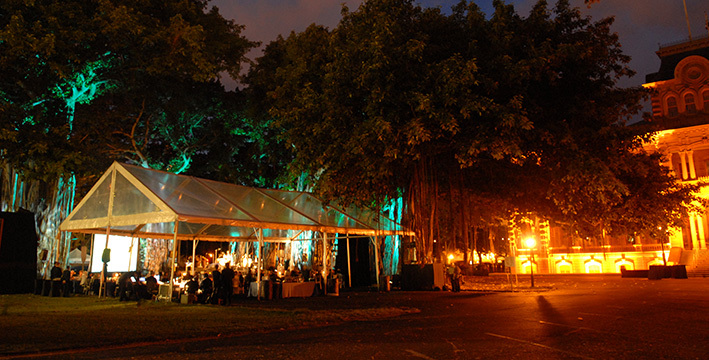 Wedding ceremonies with 11 or more attendees must complete a venue rental application and submit to the Friends of Iolani Palace. The fee is $1,950.00 plus tax. Wedding Ceremonies with less than 11 participants must obtain a permit directly from the State of Hawaii, Department of Land and Natural Resources (DLNR). Currently, there is no fee for this permit. Please allow for at least 45 days for processing by DLNR. Note: The State of Hawaii requires your wedding photographer to apply for a Standard Film Permit. This can be obtained online from the State of Hawaii Film Office for which there is a $100.00 permit fee. Rental prices are subject to change. Alcoholic beverages are allowed with the proper approval and permitting. 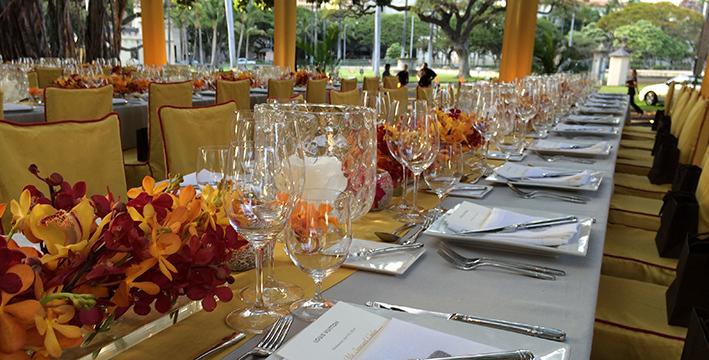 All parking areas on the Iolani Palace Grounds are available for your guests upon request based on applicable fees. Effective July 1, 2015 “Smoking, Use of Electronic Smoking Devices, or Use of Tobacco or Betel Nut Products (is)Prohibited by Law” in all state parks including Iolani Palace grounds. Policy on use: The grounds of Iolani Palace are a wahi pana (a sacred place) for the Hawaiian people. The historic site was home of the Mo'i (the royal Hawaiian sovereign) from 1845 to 1893. It contains an important burial ground, an architectural treasure, and a repository of priceless cultural artifacts. The State of Hawaii holds the grounds in trust as part of the ceded land inventory. Through a lease agreement with the State, the kuleana (responsibility) for the site and its structures is assigned to the Friends of Iolani Palace (The Friends). The Friends is a private non-profit native Hawaiian organization established in 1966 for the sole purpose of perpetuating the legacy of Iolani Palace. The buildings leased to The Friends by the State of Hawaii are available for use by the public, provided that event fees are directed to Palace operations. The surrounding grounds are administered by State Parks, a division of the Department of Land and Natural Resources (DLNR). The Friends of 'Iolani Palace recognizes the challenge inherent in balancing its commitment to protect and preserve Iolani Palace with the legitimate need for public access. 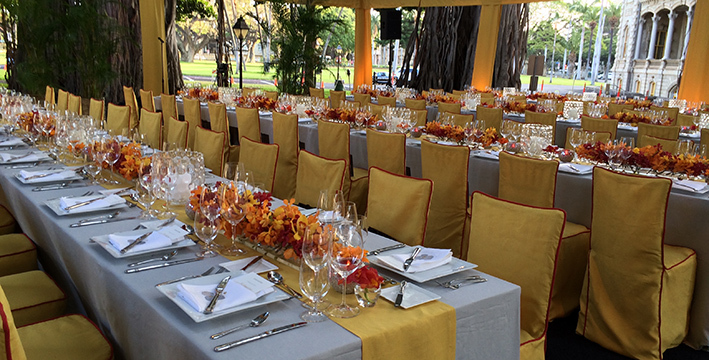 The event rental policies set forth by the Friends seek to allow public access while holding to the highest standards of curatorial excellence and preserving the site's distinctive sense of place. The Friends reserves the right to deny requests for functions that are not in keeping with its purpose. 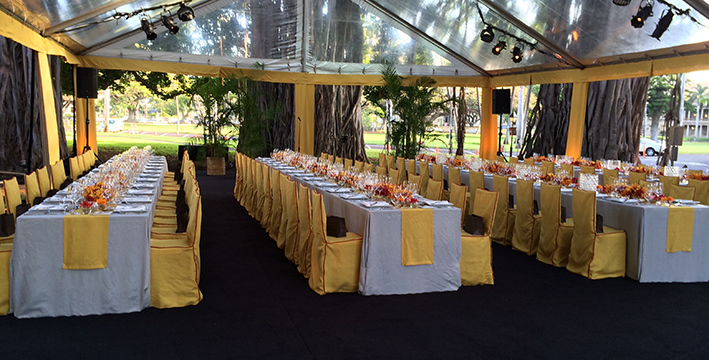 Contact Special Events at events@iolanipalace.org or 808-330-4537.